This past week I was lucky enough to spend Thanksgiving in my home state of Michigan. I am so thankful to have such an amazing and large family, wonderful friends, good health and happiness. But enough sentimental crap, let’s get to the good stuff: DESSERT. I was in charge of our holiday’s sweet treats and decided to get creative this year. 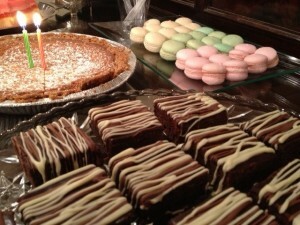 My dad thinks these desserts are “fancy.” I call them fun! 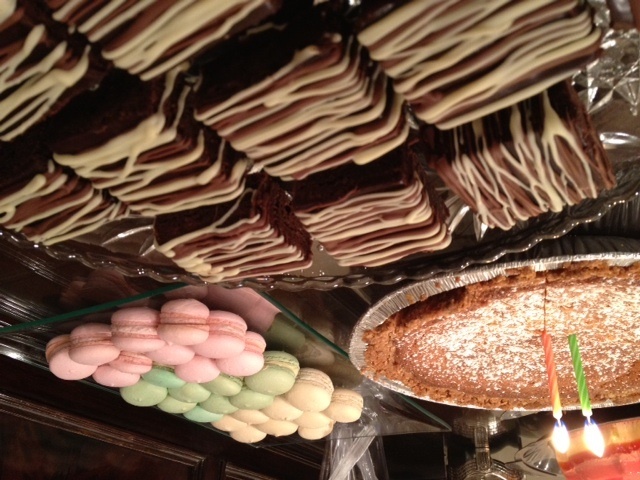 I made triple chocolate drizzled fudge brownies, raspberry, pistachio and vanilla bean French macaroons, as well as crack pie. 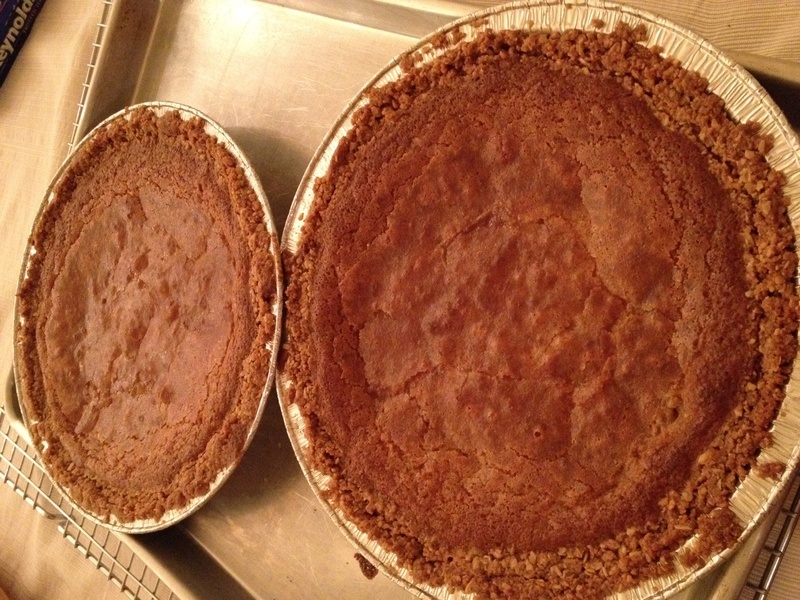 Crack Pie is an addictive pie created by accident at Momofuko Milk Bar in NYC. The taste is really indescribable – somewhere between dulce de leche and pecan pie filling (minus the pecans) baked into an oatmeal cookie crust. Sweet, custardy and delicious, it was one of my favorite indulgences when I lived in The Big Apple. So when the cookbook went on sale last month, I was first in line to pre-order. The results did not disappoint. I’m hooked once again. 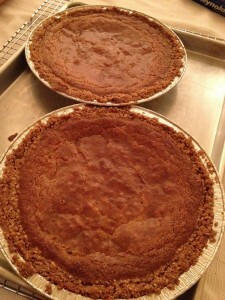 If crack pie is a drug, I need another hit. Many of the recipes in the book may be a little complicated for the average home cook, requiring specialty ingredients like corn powder and glucose. Fear not, Bon Appetit did a story last year on this pie (THAT’S HOW GOOD IT IS) with a simpler version for all of you at-home bakers. So for everyone asking for the recipe, here ya go…. Preheat oven to 350°F. Line 13×9x2-inch metal baking pan with parchment paper; coat with nonstick spray. Combine 6 tablespoons butter, 4 tablespoons brown sugar, and 2 tablespoons sugar in medium bowl. Using electric mixer, beat mixture until light and fluffy, occasionally scraping down sides of bowl, about 2 minutes. Add egg; beat until pale and fluffy. Add oats, flour, baking powder, baking soda, and salt and beat until well blended, about 1 minute. Turn oat mixture out onto prepared baking pan; press out evenly to edges of pan. Bake until light golden on top, 17 to 18 minutes. Transfer baking pan to rack and cool cookie completely. Position rack in center of oven and preheat to 350°F. Whisk both sugars, milk powder, and salt in medium bowl to blend. Add melted butter and whisk until blended. Add cream, then egg yolks and vanilla and whisk until well blended. Pour filling into crust. Bake pie 30 minutes (filling may begin to bubble). Reduce oven temperature to 325°F. Continue to bake pie until filling is brown in spots and set around edges but center still moves slightly when pie dish is gently shaken, about 20 minutes longer. Cool pie 2 hours in pie dish on rack. Chill uncovered overnight. DO AHEAD Can be made 2 days ahead. Cover; keep chilled.Sift powdered sugar lightly over top of pie. Cut pie into wedges and serve cold. *I have not tried the above recipe, but I know several people who did with great results. But if you want it to taste most authentic, I encourage you to buy the book and go for it at home like I did! There are so many other incredible recipes in this book it is definitely a worthwhile investment. And email me with any questions on method or where to source ingredients.